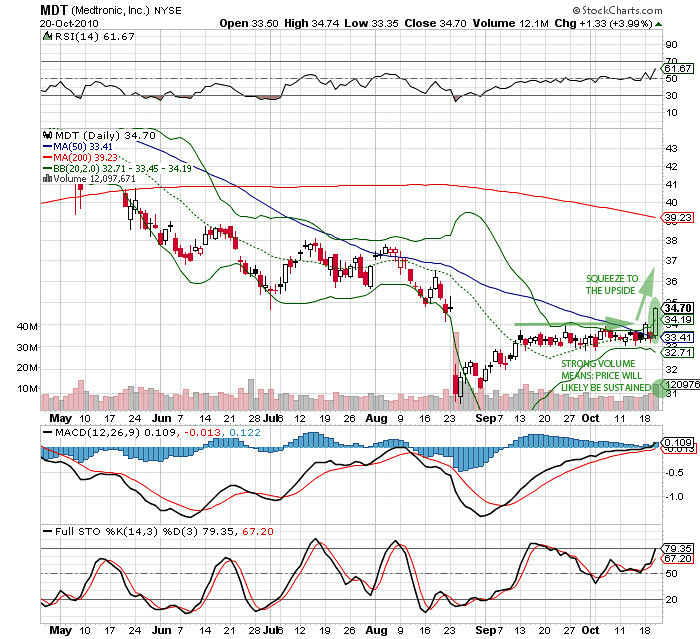 I’m anticipating a volatility squeeze on MDT’s price action. Some technicals are aligning very well. 1) The stochastics are in an uptrend while the price action remains stable or flat. 2) On the weekly chart, the MACD histogram is on a positive slope while the price action is showing a negative slope. 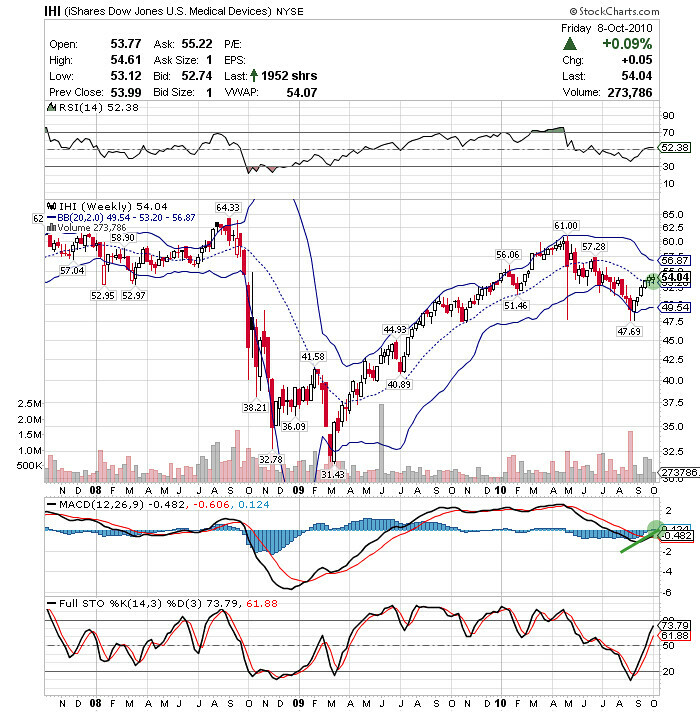 This is called the bullish negative divergence showing lower lows in the price and higher lows in the MACD. Also, the chart looks like a bullish cup-handle pattern. Am I simply biased to the bullish side? No, I’m not: I’ve reversed the charts and it looked to me like the chart was heading down. Before commiting to a bullish buy side plan, I asked the performance question on the sector MDT is in: How well is the medical devices sector doing in general? 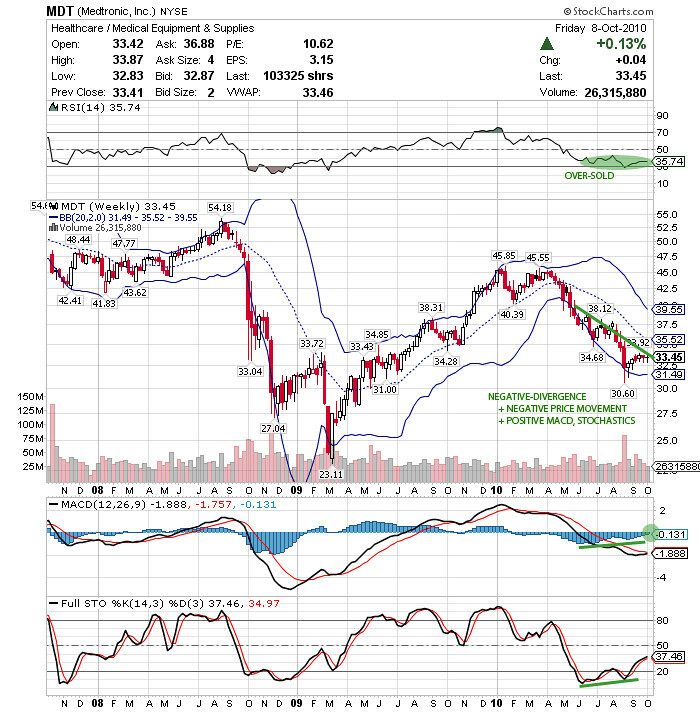 So I looked at IHI, iShares US Medical Devices ETF. On the long term horizon using the weekly chart, the prices are now back to the 20 SMA which is historically significant. What do I mean by significant? If you look at the chart, the 20 SMA has been acting as both support and resistance. Now the 20 SMA is becoming support from being resistance. We can observe some bullish technicals on the long term chart on IHI. 2) MACD historgram is on a uptrend and has crossed over the centerline to the positive side. 3) 13 EMA is now on a slightly positive slope telling us that it’s time for accumulation on every over-sold signals. 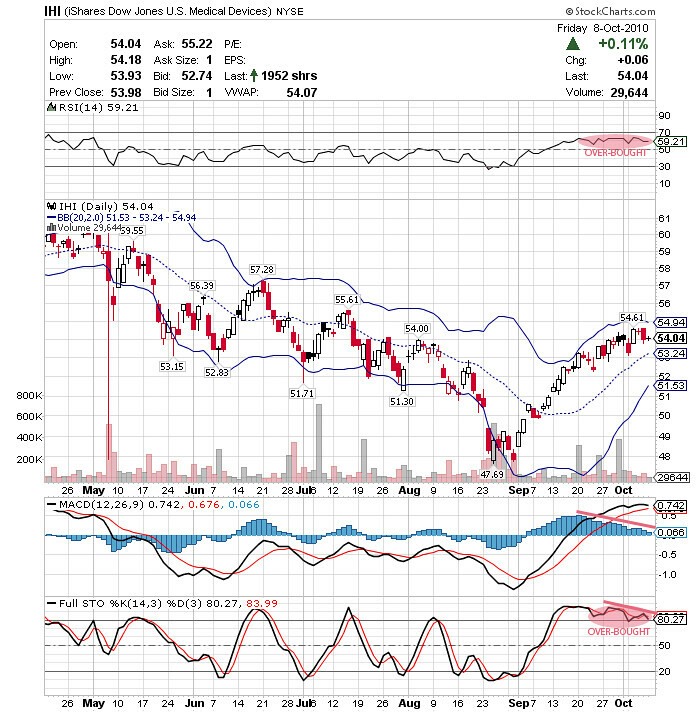 Oh hell, IHI looks like a good buy as well for a month long trade. But let’s look at the daily chart of the IHI before deciding on whether to hop on the IHI train. The daily chart of the IHI tells us that the IHI is over-bought. So this increases the risk of my trade on IHI as well as the MDT: If I wait a bit longer, I could probably get in at a better price. Is the over-bought signal going to prevent me from going in? No, it’s not. Historically, the over-bought signal persists on bull markets. If we do not go in at all because of over-bought signals during bull markets, we would have never made any money. However, the risk profile goes up and as such, we trade accordingly: Put a portion of the planned amount and accumulate on any type of over-sold conditions. Now you wonder, how are others in the IHI look like. 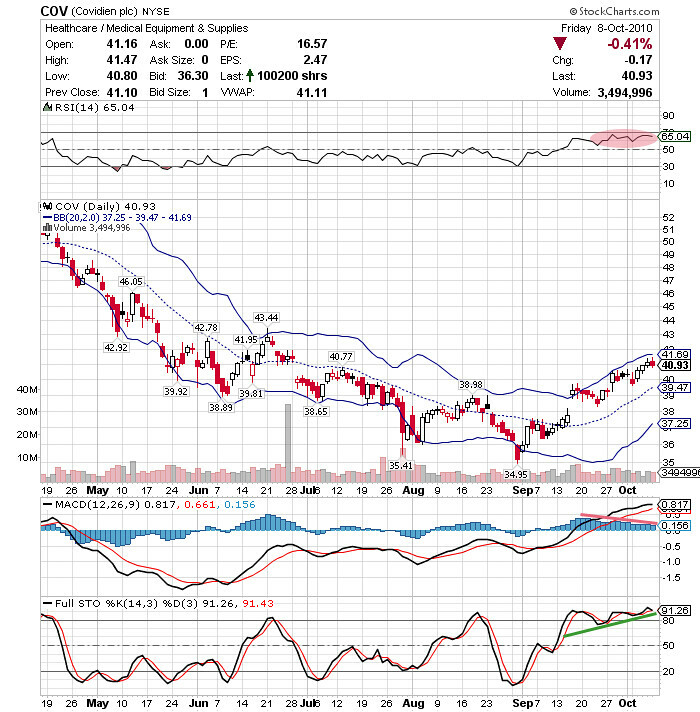 The next top holding positions in IHI is COV, Covidien Ltd. COV chart looks the same. I see the bullish cup-handle pattern and the weekly chart moving above the 13EMA which is a historically significant average. How about TMO, the third largest? TMO chart looks the same. But I have to admit that TMO looks like a short-term short. So you would ask at this point, why MDT when others in the same sector looks the same? The answer is simple on this one: Price to earnings ratio. TMO has a PE of 16 and TMO 20. MDT has a PE of 10! I see relative outperformance in MDT among others in the same sector. Now the decision to trade the MDT has been decided. What do we do now? I’m excited, you’re excited, and we’re excited because we’re going to make gazillions so we should go all in, right? No. You should start thinking, what if I’m *wrong*. What would be the cost of being wrong? What is the cost or penalty that I can handle if I’m wrong? The next thing you need to do is to determine your risk tolerance. For example, let’s say it’s $1,000 meaning I’m ok with losing $1,000. The Friday’s close was at 33.45. In the last two weeks, the lowest low was at 33.05. I would put a stop at 32.90; so my risk here is $0.55(=33.45-32.90) a share, a little less than a 2% loss. Since my loss tolerance is $1,000, I would buy 1,818 (=1,000/0.55) shares. The 1,818 MDT shares translates to $60,903. So that’s how much I would buy if my loss tolerance is $1,000. I would prefer 1,800 shares just in case I want to sell 18 call contracts to the upside later on. Now, we can think about reward. We should ask the question whether making this trade is sensible. What’s the risk-reward ratio? If the volatility squeeze happens to the upside and I’m right, I see this going to the 200 SMA at around $39 which is a little less than 20% upside in the long term. So the risk reward ratio is around 1:8 which is not a bad trade. In the short term, there is resistance at around 35.50 at which point people who got in recently at that price would try to break even providing selling pressure. You can sell all or a portion at that level if the price doesn’t break above the resistance. I prefer selling a portion to realize some gains and have the remainder capture the likely upside as long as the weekly uptrend is intact. The story doesn’t end here. Because you need to manager your positions if the price moves higher and higher; however, that’s another story. As a lot of people would say, it really depends on how it looks like at that moment in time; you have new information, you change your strategy. We just had what has been expected. We have a volatility squeeze to the upside. 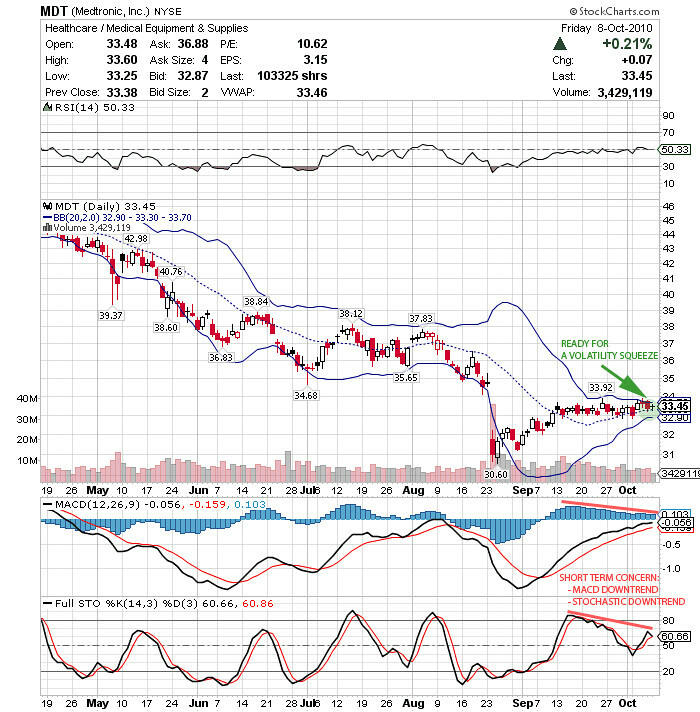 I see it highly likely to continue its price movement to the upside to the $39 area. At the moment, once we reach the $39 area, we’ll see consolidation before making a move above $39 or see rejection to the downside. I don’t know what’s going to happen exactly; I just know the likelihood.